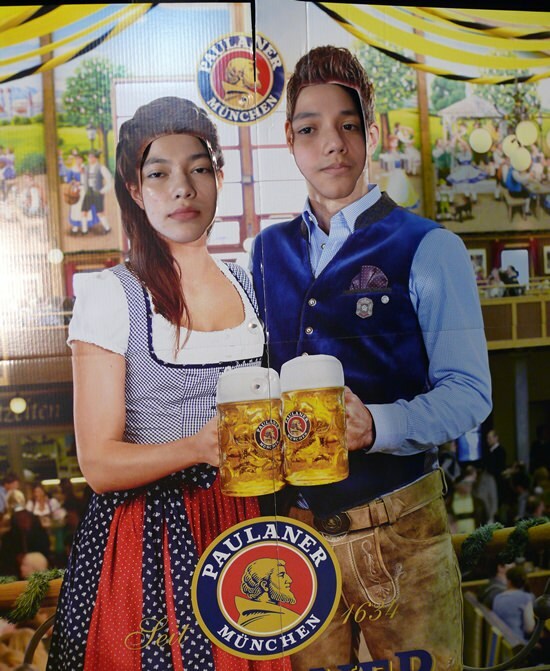 This is the time of year known as Oktoberfest in Munich (Germany), a 16-day folk festival running from mid or late September through to October. It is the world’s largest Volksfest (beer festival and travelling funfair). Held annually in Munich, Bavaria, Germany, more than 6 million people from around the world attend the event every year. In Munich, it is often simply called the Wiesn, after the colloquial name of the fairgrounds (Theresienwiese) themselves. The Oktoberfest is an important part of Bavarian culture, having been held since 1810. Other cities across the world also hold Oktoberfest celebrations, modeled after the original Munich event. 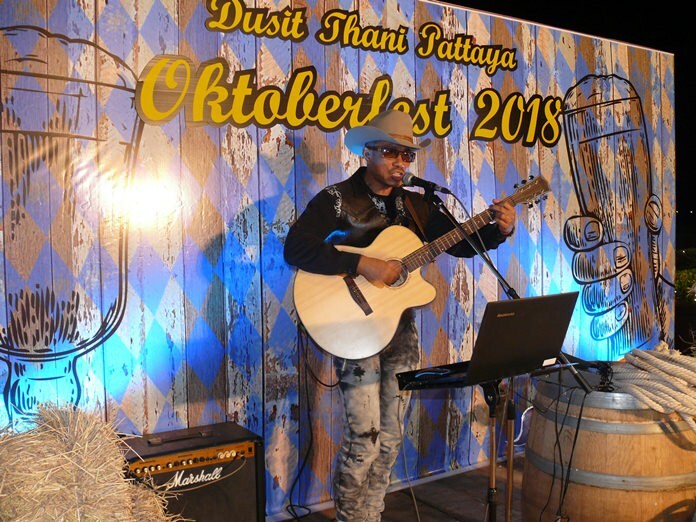 Those other cities include Pattaya with the Dusit Thani Pattaya adding to the six million every Friday night for a lighthearted celebration of the Munich event, which the Dusit calls Drink – Food – Fun. 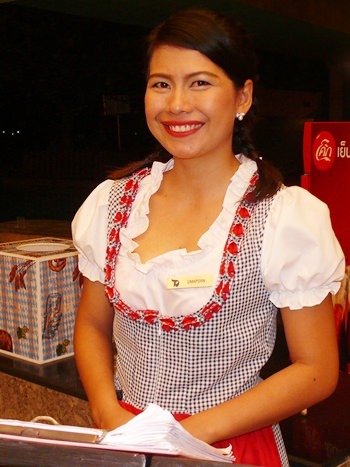 Staff turned out in dirndl. I have always said that ‘food’ should be ‘fun’ as well as sustenance, and the Dusit’s executive chef, Pathma, feels the same. Hearkening back to the Skewers promotion earlier this year and a monster hamburger on an extra-long skewer, that was his lead-up to the fun at the Oktober celebration. 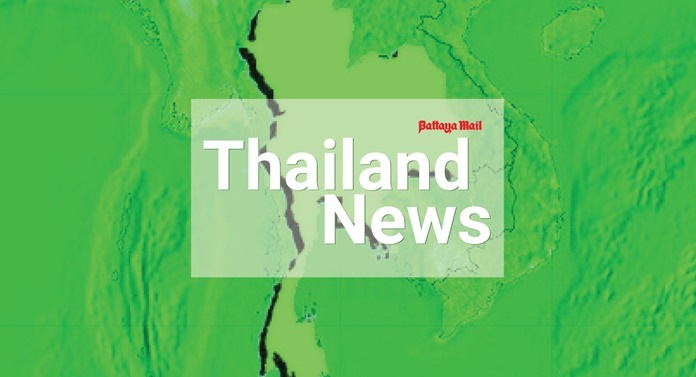 Surely everyone knows where the Dusit Thani Resort is situated, but if you are a newbie, it is reached from the Dolphin Roundabout, being careful as Thai traffic can be unpredictable at roundabouts! Once past the Dusit Check Point Charlie, you will find plenty of secure parking areas and then come into the resort building proper. 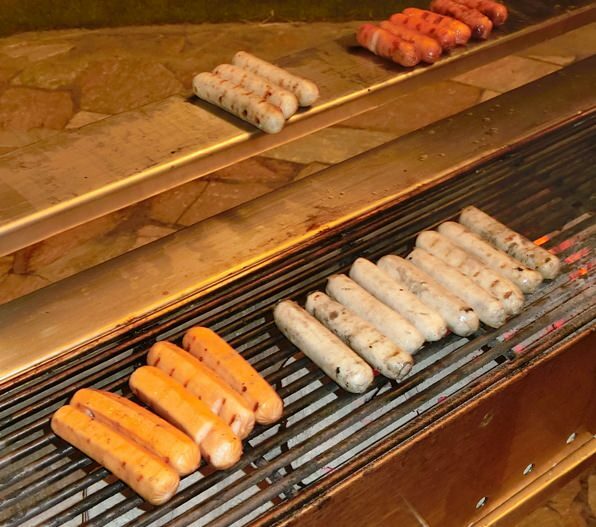 Signs will lead you to the Skewers restaurant which overlooks Pattaya Bay and is served with its warm breezes. The main area for the Oktoberfest is transformed into a ‘country’ scene complete with hay bales and a C&W singer, plus BBQ equipment for the five different types of German sausage. The service personnel ladies were dressed in the red and white dirndl and the lads in blue shirts and braces, though not lederhosen. One of the German guests I know advised me of the names of the sausages, which were German Bratwurst, Nurnberger, Wiener wurst and Thuringer bratwurst plus one other, but it was getting late and after much of the rather more-ish Paulaner beer (brewed in Munich) I did not have any room for more sausage, though did have some Schweinshaxe (pork knuckle) and sampled a Korobuta pork burger, braised with egg, cheddar cheese, caramelized onion jam, tomato, cucumber, romaine lettuce and potato (from the a la carte menu). The potatoes alone deserve their own mention, with the Junior tasters both giving the waffle potatoes (deep fried in spices) and the mashed potato top marks. We were lucky to dine with Dusit Thani Pattaya GM Neoh Kean Boon and Chef Pathma was making sure everyone was satiated. In addition, a rather vivacious Thai MC took the floor and introduced some of the diners to various games involving ping pong balls (no, not those sort of games) or finding items while blind folded after being spun around. If you want to lose your dinner, this is your game. Getting in costume – the easy way. 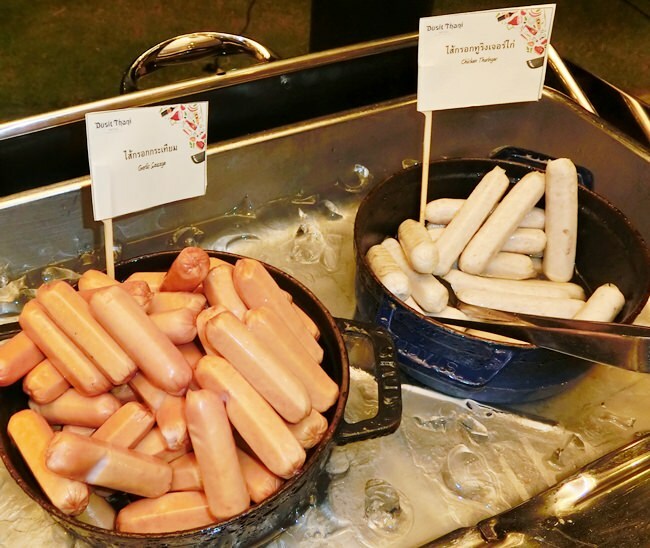 We thoroughly enjoyed the evening, even though it wasn’t quite the Oktobertfest we imagined – no oompahpah. The event is on the Friday evenings during October, best to book. 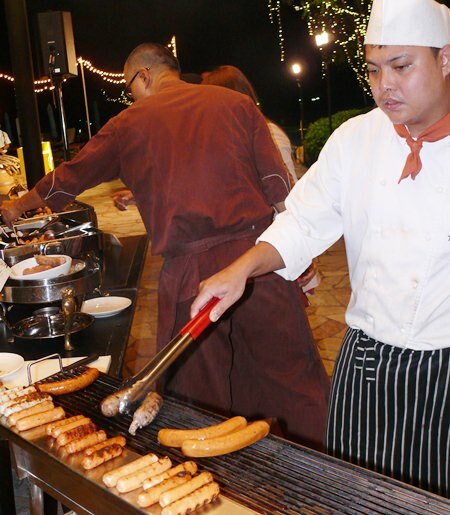 Oktoberfest, The Bay International Skewers Restaurant, Dusit Thani Resort Pattaya, 240/2 Pattaya Beach Road, North Pattaya (opposite the Dolphin roundabout), telephone 038 425 611, fax 038 428 239, or email [email protected] . open six days (closed Sundays), 6.30 to 10 p.m. secure parking, and Oktoberfest celebrated every Friday in October at B. 430 ++ or with free flow beverages at B. 599 ++.